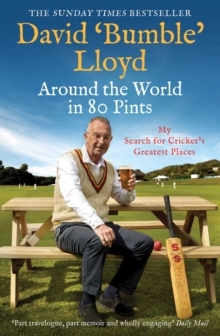 'Part travelogue, part memoir and wholly engaging' Daily MailBestselling author and hugely popular commentator David 'Bumble' Lloyd takes the reader on an unmissable and hilarious tour of the cricketing world as he searches for the perfect pint. After more than 50 years involved with cricket as a player, international, umpire, coach and now commentator, David Lloyd has travelled the world. It's all a long way from his childhood, growing up in a terraced house in post-war Accrington, Lancashire. But cricket has taken him all over the globe, and he has experienced everything from excruciating agony Down Under to the Bollywood glamour of the IPL - he's even risked it all to cross the Pennines into Yorkshire. In Around the World in 80 Pints, Bumble relives some of the most exciting and remarkable periods in his life, showing how his travels have opened up new and exciting avenues for him. The book is packed full of brilliant stories from famous Ashes matches and Roses clashes, sharing the commentary box with Ian Botham and Shane Warne, and much else besides - all told in his idiosyncratic style that has won him so many fans the world over. His previous autobiography, Last in the Tin Bath, was a huge bestseller, and this one is sure to appeal to anyone who shares Bumble's unquenchable love for cricket - and life!